recording. Again, Anton Fig is brought in to fill in. * Plans for a second movie, entitled "Behind the Mask" are put on hold. with the band is the filming of the "Shandi" promotional video clip. applicants are looked over. Thirty are called for an audition. likes his charisma and charm, as well as his strong vocal capabilities. on the Sunday morning children's program "Kids Are People Too." * Eric makes his live debut with Kiss at the Palladium in New York City. * "Tomorrow" is released as the second single off of "Unmasked" in America. as the album's second single. of their most successful tours, with 6 sold out stadium concerts. sounding album, along the lines of their earlier albums. "Destroyer"
producer Bob Ezrin is brought in to work with them. mythological characters and heroes. The story is written by Gene. * Due to the album's failure, Kiss decides not to tour. * Paul and Gene get involved in Cerebral Palsy charities. live. Kiss also plays "I" on the syndicated music show "Solid Gold." Tonight, "Down on Your Knees," "Nowhere to Run" and "Partners in Crime." on of the songs. Bob Kulick steps in for most of the lead guitar work. are now handled by their business management. for work on their next album. Billboard charts and eventually goes gold. them, but also decides to leave the group once they return to America. * "I Love it Loud" is released as the album's only single. It "bubbles"
under the Billboard Hot 100 chart at #102.
problems: 1. poor attendance. The band plays to numerous half empty venues. these two problems that the tour is called off halfway through. * The band travels to South America for the first time in their career. concert audiences total nearly 200,000 people per show. contributes a great deal of new material. band members wore the day of the shoot. going platinum. The video of the title track gets heavy airplay on MTV. * The band travels to Europe for their third tour of the continent. * "All Hell's Breakin' Loose" is the album's second video and single. The video gets decent airplay, but the single fails to chart. sides cause Vinnie to leave in the spring. Vinnie's replacement. He changes his name to Mark St. John. * The band begin work on their 19th album, produced by Paul Stanley. movie "Runaway" takes him away from the studio. over the master tapes to Polygram, he decides to remix the entire album. cinematography at the first ever MTV Video Music Awards. makes his hands and joints swell up and he is unable to play guitar. 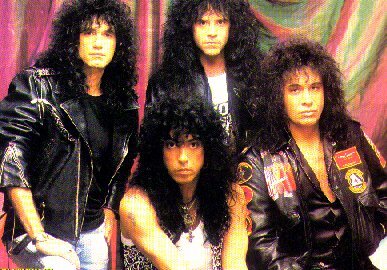 song "Lonely is the Hunter" on the "Animalize" album. band make a decision and decide to make Bruce a full time member. * "Thrills in the Night" is released as a single. It fails to chart. Arena in East Rutherford, NJ in March. * The "Animalize Live Uncensored" home video is released in the spring. album to be worked on in New York. on the Billboard charts and eventually goes platinum. a #1 requested video on MTV's new "Dial MTV" program. back a few weeks due to Paul suffering from a groin injury. * "Who Wants to Be Lonely" is the third video to be filmed from "Asylum." It receives minimal MTV airplay. chart. It reaches platinum status. full houses, some half full. up logo that made them famous. * "Turn on the Night" is released as a single. It fails to chart. to discuss life on the road and groupies. for their upcoming European tour. all three videos from the last album. well with both Peter and with Kiss fans. on the Billboard charts. It ultimately makes double platinum status. * "(You Make Me)Rock Hard" is released as a single. It fails to chart. The video gets minimal airplay on MTV's "Headbanger's Ball" program. Gary Corbett, bassist Dennis St. James and future Kiss drummer Eric Singer. area, but also travels to Ohio and Los Angeles. Kiss matters and less on outside projects like acting and managing. Gene understands and begins to focus more on the band. down their sound to being more guitar oriented. Carr's first original composition/vocal on the song "Little Caesar." The album peaks at #29 and goes gold. * Plans for a "return to form" stage show are made, based on the "sphinx"
sales slip, causing the band to put their touring plans on hold. KISS Biography Part 2 has been visited times.